I’d have to say that things seem to be going fairly well today as the fighting tapers off in Basra and the rest of Iraq. Most noted news today is that Operations in Basra should come to an end by the latter part of this week and that the curfew in Baghdad has now been lifted. An Iraqi parliamentarian hails Iraqi cleric Moqtada al-Sadr's order to demilitarize its loyalists to bring a halt to the military clashes extended in southern Iraqi city of Basar... In an interview with Alalam, Legha Ale Yasin said that in case of no military or political interference by occupier forces, more agreements could be settled to bring an extensive peace and security in the region... "Yet Sadr movement has fulfilled its entire obligation in demilitarizing its fighters. So it expects the government to bring an end to its random raids targeting his loyalists," she said. * Joining the co-conspirators on a flight from Nairobi to Karachi, Pakistan, one day prior to the bombing. The charges are only allegations that the accused has committed offenses under the Military Commissions Act, and the accused remains innocent unless proven guilty beyond a reasonable doubt. The Department of Defense today announced the change in status of a soldier supporting Operation Iraqi Freedom from missing-captured to deceased. The armed forces medical examiner confirmed on March 29th, human remains recovered in Iraq were those of Staff Sgt. Keith M. Maupin, 24, of Batavia, Ohio. Maupin had been listed as missing-captured since April 16, 2004. His convoy came under attack by individuals using rocket-propelled grenades and small arms fire on April 9, 2004. He was assigned to the 724th Transportation Company, Bartonville, Ill.
Media with queries regarding operations in Iraq should contact the Multi-National Division  Baghdad public affairs office, (914) 822-8174, or email mndb_pao_cic@mnd-b.army.mil ... Change-in-status questions should be directed to Shari Lawrence, deputy public affairs officer for U.S. Army Human Resources Command, Alexandria, Va., (703) 325-8856. Media may contact the public affairs officer assisting the Maupin family, Lt. Col. Willie Harris, U.S. Army Reserve Command, (404) 201-1770. GRAHAM: Well, I would argue we have stabilized events in Iraq dramatically by having better security. 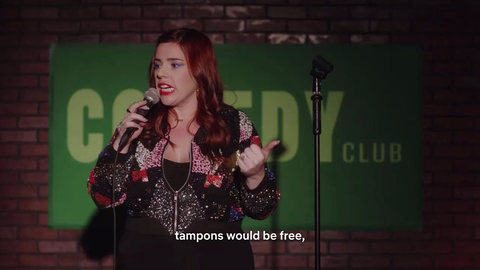 There are really three fights going on. The fight against Al Qaeda in Anbar has turned our way dramatically because the Anbar province is now liberated from Al Qaeda because Sunni Arab Iraqis aligned with us to fight Al Qaeda, and that's been a great success story, the surge. The Kurdish separatists in the north have been contained — military operations by Turkey but, more importantly, by Iraqi Kurdish politicians trying to control the separatist movement. Now the fight's moved to the south. Iran is backing the Shia militias. I don't know how much power Al-Sadr has. If he said stop fighting tomorrow, I don't know if people would listen. Part of the problem has been that the cease-fire was never fully embraced by the Shia militias — the Mahdi army in the south. So at the end of the day, Sadr is a minority within the parliament. Politically, he's a minority. The other Shia parties have rallied around Maliki. So have the Sunnis. If he comes out of this thing stronger politically and militarily, and his desire is to align with Iran, it's a bad thing. Sadr reins in Shiite militiamen, sends mixed signals. About News Video: The Iraqi prime minister says a decision by Shiite cleric Muqtada al-Sadr to pull his fighters off the streets is "a step in the right direction." Spc. Joshua A. Molina, 20, of Houston, Texas, died March 27th in Baghdad, Iraq, of wounds suffered when his vehicle encountered an improvised explosive device. He was assigned to the 1st Squadron, 2nd Stryker Cavalry Regiment, Vilseck, Germany. I haven’t been by Mohammed Fadhil’s Blog, Iraq The Model, in a while but today I went by and as usual... found another very informative read by the man. Fadhil is a Baghdad Editor for Pajamas Media. * Photo for the Day * Children crowd into class during the first day of school at Jan Qadam elementary school, in Afghanistan's Parwan province, March 24, 2008. Village elders, Ministry of Education officials and coalition soldiers gathered to celebrate the first day of school and to dedicate the new school library and science lab. Spc. Gregory B. Rundell, 21, of Ramsey, Minn., died March 26th in Taji Iraq, of wounds suffered from small arms fire. He was assigned to the 1st Battalion, 27th Infantry Regiment, 2nd Brigade Combat Team, 25th Infantry Division, Schofield Barracks, Hawaii. For more information media may contact the 25th Infantry Division public affairs office at (808) 655-6341. *We Will Fight To The End! President Bush gives Major Speech on Iraq today. ...The Iraqi forces are growing in capability. Recently, they planned and executed a highly effective operation to secure nearly nine million pilgrims celebrating the religious holiday of Arbaeen. And as we speak, Iraqi security forces are waging a tough battle against militia fighters and criminals in Basra -- many of whom have received arms and training and funding from Iran. Terrorists launched 11 indirect-fire attacks against civilians, Iraqi security forces and coalition forces in Baghdad today. Five indirect-fire attacks struck in the vicinity of the International Zone, killing one civilian and wounding 14. Three indirect-fire attacks struck two U.S. forward operating bases and one joint security station east of the Tigris River, injuring four U.S. soldiers. Five mortar rounds struck two joint security stations and a "Sons of Iraq" citizen security group checkpoint in West Rashid, wounding three Iraqi security volunteers. "These rogue elements are haphazardly firing rockets and mortars, killing and injuring innocent Iraqi and governmental civilians," said Army Col. Allen Batschelet, chief of staff of Multinational Division Baghdad. "(Iraqi security forces) and coalition forces are taking steps to reduce these attacks and pursue those responsible." Multinational Division Baghdad soldiers engaged and killed two terrorists spotting for the indirect-fire attacks. Terrorists also staged several attacks around Iraq yesterday, firing 16 rockets into the International Zone in Baghdad and targeting members of the Sons of Iraq in Tikrit and Salahuddin. The 16 rockets were fired into the International Zone from surrounding Baghdad districts in four separate attacks during the morning and early afternoon. At about 5:30 a.m., five 107 mm rockets hit the International Zone; four more 107 mm rockets struck at about 9:15 a.m.; three 107 mm rockets were in the third attack; and four 107 mm rockets struck at about 2:50 p.m. One coalition force soldier, two U.S. civilians, and one Iraqi army soldier were wounded in the attack. Several structures and one vehicle also were damaged. 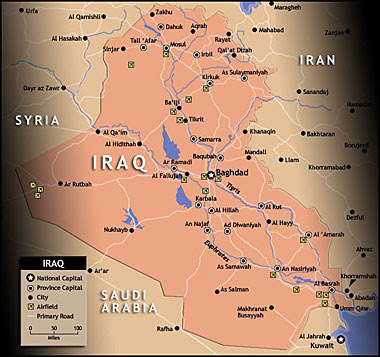 In Salahuddin, two Sons of Iraq were murdered, and a woman and child were injured in an attack by al Qaeda in Iraq. The two men killed were father and son and confirmed members of the Sons of Iraq in Samarra. The woman and child were transported to a coalition forces hospital for treatment. In Tikrit, a car bomb detonated, injuring seven Sons of Iraq and two Iraqi citizens. The injured were evacuated to a local Iraqi medical facility for treatment. "This incident is just another example of the desperation (al Qaeda in Iraq) is showing," said Army Maj. Dan Meyers, a spokesman for Multinational Division North. "Acts of intimidation and cowardice such as these demonstrate the lack of regard for innocent civilian life." In separate operations March 25 and yesterday, Iraqi special operations forces advised by U.S. Special Forces soldiers detained eight suspects. In Baghdad, Iraqi Special Forces detained one suspected al Qaeda member who helped create a suicide network associated with attacks against Iraqi and coalition forces in the Baghdad area. The suspect also recently formed a criminal group to conduct attacks against coalition forces in Tahrir, southeast of Baghdad. Two additional suspects were detained in the operation and are being held for further questioning. In Basra, Iraqi special forces troops detained a suspected criminal who is reported to be an illegal weapons dealer in the area. The suspect is believed to be smuggling and selling massive amounts of weapons to Iranian-backed "special groups" and criminal elements that attack Iraqi and coalition forces. Four other suspects were detained and are being held for questioning. In other developments, coalition forces conducted operations throughout Iraq on March 25 and yesterday, targeting suspected terrorists who are believed to be associated with al Qaeda in Iraq senior leadership and others suspected of organizing suicide bombings. In Tikrit, intelligence sources led coalition forces to a building, where they called for the occupants to come out. When the occupants did not comply, the ground force approached the building and came under a heavy small-arms attack. Coalition forces called in supporting aircraft to suppress the fire. Numerous large secondary explosions came from the building, indicating stored weapons or explosives. During the engagement, multiple terrorists exited the building and ran into adjacent buildings. Coalition forces called for civilians to exit the buildings, and women and children who complied were moved to a safe area. It was later determined other civilians remained in the building. Five terrorists, one Iraqi man, three Iraqi women and three Iraqi children were killed. Six Iraqi women, five Iraqi children and one Iraqi man were injured. The injured were treated on scene by coalition medical professionals, and all but one man were transported to a coalition medical facility for further treatment. It is uncertain whether the casualties came from coalition or terrorist fire. "These terrorists have a complete disregard for humanity and constantly place innocent Iraqis in harm's way, as they did here by invading civilian homes and continuing to engage coalition forces, using the homes for cover and concealment," said Navy Capt. Vic Beck, a Multinational Force Iraq spokesman. In the northern part of the country, intelligence reports led coalition forces to Mosul, where they captured an alleged terrorist suspected to be a suicide bomb cell leader with strong ties to terrorists in that area. He is believed to have a role in recent suicide attacks in Mosul. Coalition forces also detained two other suspected terrorists in that operation. West of Samarra yesterday, coalition forces detained three suspected terrorists during an operation targeting associates of al Qaeda in Iraq senior leaders. "Al Qaeda in Iraq is an adaptive, barbaric enemy that will use any means possible to create violence," Beck said. "Despite their calls for violence, Iraqis continue to reject the terrorists' Taliban-like ideology and are working with Iraqi and coalition forces for a safe and secure Iraq." -- Multinational Division Baghdad attack helicopter crews destroyed two enemy positions in separate attacks in Baghdad. 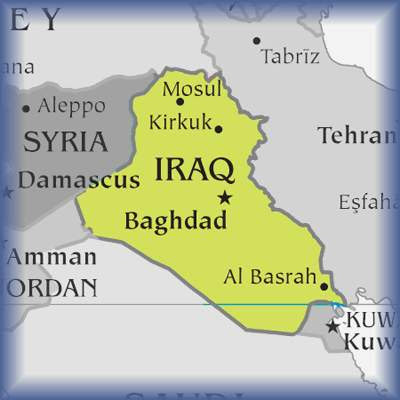 No coalition forces or Iraqi citizens were injured as a result of the two attacks. 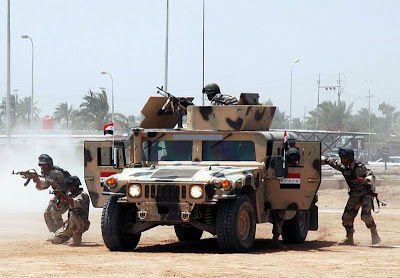 -- Iraqi security forces responded to enemy gun fire in the city of Kut, where fighting broke out in areas known as criminal strongholds several hours after a curfew was imposed by Iraqi forces. -- A combined Iraqi police and Iraqi army force stopped an organized attack in Hillah. A military-style force, armed with AK-47 assault rifles and rocket-propelled grenades, attacked coalition and Iraqi forces with RPGs. Iraqi army and police forces counterattacked, secured major intersections, and engaged the militants over the course of several hours, forcing them to retreat to a mosque. -- Coalition soldiers found and destroyed four suspected car bombs in the southern Diyala river valley during Operation Viking Expedition. As part of the operation, air weapon team helicopters engaged three suspicious vehicles, destroying them with Hellfire missiles. After a search of the area, a bunker was found containing another vehicle, as well as a small cache nearby. The bunker and cache were destroyed by two bombs dropped by close-air support planes. In operations March 24 and 25, Iraqi security forces detained 15 suspects and coalition forces found two weapons caches. In Baghdad, Iraqi special operations forces detained a suspected criminal cell leader reported to be responsible for improvised explosive device cell members who have attacked Iraqi and coalition forces in the Baghdad area. Three additional suspected cell members were also detained. In Samarra, Iraqi National Police detained a suspected al Qaeda in Iraq military commander, who is reported to lead 25 fighters in the greater Samarra area. He also is believed to have been involved in organizing small-arms fire, IED and car-bomb attacks against Iraqi and coalition forces. Ten additional suspects are being held for further questioning. Sons of Iraq members and an informant provided information to coalition force soldiers that led to two weapons caches in the Shaka 3 region of Iraq. The first cache, discovered March 24, consisted of 38 rifle grenades, 64 OG-15P grenades, 27 OG-9 rockets, 21 PG-9 rockets, two OG-7 rockets and an anti-tank mine. The second cache was discovered the following day based on a tip from an informant and contained 400 heavy machine gun rounds. "Situation in the Middle East, including the Palestinian question"
Allow me to congratulate you on your very able stewardship of the Council this month, and thank you for your principled leadership. We are grateful to the Secretary-General for honoring us with his presence and for his commitment. I also wish to thank Under-Secretary-General Pascoe for his briefing. On this note, I wish to make clear that Israel does not act against "alleged" militants but against declared and recognized terrorists. I hope "alleged militants" is not the UN's new definition of terrorism. The struggle of the moderates against the extremists which is raging around the world is the defining challenge of our day. Across the globe, forces of extremism seek to transform resolvable political conflicts into endless religious wars, using all means of violence at their disposal. They fight not for their own rights, but to deprive the rights of others. In our region, Iran, a notorious state sponsor of terrorism, uses proxies like Hizbullah in Lebanon and Hamas among the Palestinians to draw the moderates into a cosmic battle, where victory is not about achievement but about total annihilation. The very ideology of the extremists makes a dialogue with them impossible. Which is why Israel - along with other like-minded states - understands that dealing with extremists is a zero-sum equation. In contrast, negotiations with the moderates, as Israel is doing with a moderate Palestinian Authority leadership that renounces terrorism and violence, can yield great benefit for both parties. I want to believe that my Palestinian colleague represents the moderates in spite of the distorted picture he felt compelled to draw today. As we have seen, the extremists will stop at nothing to break the coalition of moderates and destroy all prospects for peace. During the last month, Hamas fired more than 300 rockets at Israel, at least 23 of them Iranian-made Grad missiles that hit the city of Ashkelon, a quaint coastal city with a population of 120,000. The rocket attacks marked an escalation of violence not just in number, but also in weaponry. Grad rockets - smuggled into the Gaza Strip from Iran during the breach of the Gaza border this January - have greater range, larger warheads, and fragment on impact. Hamas' new weapon of choice means that a quarter of a million Israeli civilians now live in constant danger of rocket fire. We can all thank Iran for adding another weapon to the Hamas arsenal, in addition to its already heinous suicide attacks and deadly Qassam rockets. Hamas and its terrorist state backers bear sole responsibility for the escalation of violence. The Secretary-General rightfully told the Council at the meeting held earlier this month (quote) "I condemn Palestinian rocket attacks and call for the immediate cessation of such acts of terrorism, which serve no purpose, endanger Israeli civilians and bring misery to the Palestinian people" (end quote). Indeed, it is terrorism - plain and simple. As Hamas unleashed its terrorism on the civilians of Ashkelon, it continued to wreak havoc and daily terror on the people of Sderot - a small but resilient city of 23,000, where children no longer run around on playgrounds; they now run to bomb shelters. Such is the reality in Sderot, where 15 seconds is all you have to find safety before a Qassam rocket comes crashing down. Though some wish to refer to the apparent lull in Hamas' rocket attacks, I must warn that the perceived quiet is only on the surface. The bombs keep ticking, albeit quietly. The rockets out of Gaza have not stopped. Hamas is using this time to smuggle in and produce more rockets. Building rockets is not quiet. It is a silent promise - a promise of what is to come next: more terror and more violence, more extremism and more bloodshed. In fact, we have seen the great lengths that the extremists are willing to go to in order to kill and maim Israelis. Just over two weeks ago, a Palestinian terrorist infiltrated the Mercaz Harav rabbinical seminary in Jerusalem and ruthlessly gunned down eight young men, who were studying the Bible in the upstairs library. Eleven others were injured, many of whom remain in serious condition. The terrorist chose his target carefully; Mercaz Harav is one of Israel's most revered institutions of Zionism and Jewish learning, and it is situated in the heart of Jerusalem, footsteps away from the seat of the Israeli Government and our most cherished democratic institutions. As medical and rescue teams rushed to the scene, as the Israeli public heard the news of this appalling massacre, as mothers and fathers were called to retrieve the remains of their slaughtered sons, the extremists in Gaza rejoiced at the spilling of Israeli blood. I am sure that many in this Council watched with horror and disgust as Hamas terrorists joyfully fired their rifles into the air and passed out candy to children in celebration. If anyone doubted what the extremists stand for, the reaction in Gaza to the murder of eight Israeli boys sets the record straight. It was also a stark reminder that these were the same people who danced on the rooftops after 9/11. Which is why, Mr. President, it was so sad and disturbing that the Council could not condemn the terrorist attack - particularly in spite of your valiant efforts and those of many other distinguished ambassadors on the Council. The Security Council has a longstanding practice of condemning terrorism, no matter the victims, no matter the location, no matter the perpetrator, no matter the motivation. Yet the Council could not unanimously condemn this terrorist attack and intentional killing of civilians, for the Council was blocked by a politicized opposition, of one Member State in particular. The hypocrisy and cynicism displayed by this state, with its long history of terror does not bode well for this Council, and draws sad and alarming conclusions as to the screening process states undergo before attaining a seat on this august body. It was indeed a sad moment for this Council, but also one that should be a wake up call to us all. Lately, a particularly worrisome trend has been apparent when it comes to the discourse concerning our region. Some have a penchant for equating the lawful actions of states in defense of their citizens with the violence of terrorists whose goal is to endanger those very civilians. The misguided tendency to accept the "status quo" of terrorism - as expressed even by some UN officials in their statements and reports - is simply unacceptable. Such parity, which is often in the name of an ill-conceived balance, undermines the strength and credibility of moderate states to bolster one another and isolate the extremists. Israel goes to great lengths to ensure the safety and well-being of all civilian populations - Palestinian and Israeli alike. Whereas Israel makes all efforts to protect civilians in accordance with international law, Hamas indiscriminately fires rockets into Israeli civilian areas. Whereas Israel ensures that medicines and fuel enter the Gaza Strip to reach hospitals and needy civilians, Hamas hijacks those trucks and diverts them to its bomb making factories and terrorist camps. Whereas Israel allows humanitarian convoys into Gaza - more than 1600 trucks and over 20,000 tons of aid in recent weeks alone - Hamas cynically fires on those same crossing points, so it can fabricate a pretext for inciting the Palestinian public against Israel. Moreover, the cruelty of Hamas continues to be seen in its holding of Gilad Shalit, who was abducted by that terrorist organization in June 2006 and begins today his twenty-second month in captivity. All the while, Hamas has refused to provide details of his condition or well-being. We continue to hope and pray for his safe return home. Surely, no similarities can be drawn between Israel and Hamas. The immeasurable difference between the moderates and the extremists can be seen both in their rhetoric in this Hall and their actions on the ground. In this context, I can only hope that my Palestinian colleague's poignant outcry against the deliberate killing of children, describing it as a sinking to the abyss, was really directed at the Hamas terrorists he again failed to mention by name. Let us be very clear: while for Israel every dead Palestinian child is a horrible mistake and tragedy, for the terrorists every dead Israeli child is a victory and a cause for celebration. Allow me to briefly turn to the situation along our northern border. As you know, Security Council resolution 1701 (2006) changed the reality on the ground following the 2006 Second Lebanon War, and constituted an important achievement for this Council. Hence, the international community must ensure that the implementation of resolution 1701 remains a priority issue, and my delegation supports the Council taking the appropriate action to show its resolve. In this context, I wish to draw attention to three main areas: (1) stemming the illegal flow of weapons through the porous Syrian-Lebanese border, (2) preventing the rearming of Hizbullah - which has already adapted its weaponry and tactics so as to take into account the UNIFIL presence south of the Litani River, as its spokesmen openly declare - and (3) the unconditional release of our boys, the Israeli soldiers Udi Goldwasser and Eldad Regev, kidnapped on 12 July 2006 by Hizbullah. The Council, in adopting resolution 1701, committed itself to seeing their release, and I call on the membership to keep its word. To be sure, the new and improved UNIFIL on the ground is doing important work, and - among the positives on the ground - Israel welcomes the trilateral meetings between the IDF, the Lebanese Army, and UNIFIL, as well as efforts to demarcate the Blue Line. However, as I began my statement referring to the dangers of extremism, here too it must be emphasized that Hizbullah poses an extremist threat to the region. Indeed, Hizbullah and Hamas share the same strategies and tactics and are funded and supported by the same ominous backers, Syria and Iran. The relationship between Iran, Syria, Hamas and Hizbullah are continually reinforced for us, as we recently saw in the expressions of sympathy and support made by those leaders, again just yesterday, regarding the arch terrorist Imad Mughnieh. Listen to the words of the terrorist leaders themselves, like the Hamas commander in Gaza, who recently told the Sunday Times that Hamas (quote) "has sent seven 'courses' of our fighters to Iran" (end quote). According to the commander, a further 650 Hamas fighters have trained in Syria under instructors who learned their trade, techniques, and ways in Iran. Sixty-two are in Syria right now. He said, Hamas was modeling itself on Hizbullah. Clearly, Syria and Iran both play host to and support global and local terrorist organizations. The international community must press to end that support. Israel understands it must work with the moderate, legitimate Palestinian Authority leadership to show the people of the region that the path of moderation will bring tangible benefit to all. This is why suspending the ongoing dialogue and talks between Israel and the Palestinians would be a grave mistake. The extremists have no real solutions to anybody's problems. All they want is to see our failure. Moderation must be seen as the only answer and legitimate alternative to extremism. Israel knows it cannot accomplish this alone. It needs the support of like-minded moderate leaders in the region that understand the threat posed by the extremists - not just to us but to them and the world - and are willing to do what it takes. This is a goal all the moderates share. If we begin to show divisions and weaknesses, the extremists will take advantage of the indecision and hesitation. The international community needs to strengthen the bilateral process between the two parties, and to show a collective resolve to support the negotiations that will bring lasting security, stability, and peace to all people of our region. This is the mandate of the international community. This is its calling; this is its duty. The collective resolve must be shown, first and foremost, by this Council. We in Israel are committed to showing it each and every day, in partnership with the moderates around us, until moderation, modernity, and common sense prevails. Staff Sgt. Joseph D. Gamboa, 34, of Yigo, Guam, died March 25th of wounds suffered when he came under indirect fire in Baghdad, Iraq. He was assigned to the 1st Squadron, 2nd Stryker Cavalry Regiment, Vilseck, Germany. For more information media may contact the U.S. Army, Europe, public affairs office at 011-49-6221-57-5816 or 8694, or email: http://www2.blogger.com/ocpa.pi@eur.army.mil. The Department of Defense announced today the death of four soldiers who were supporting Operation Iraqi Freedom. They died March 24th in Baghdad, Iraq, from wounds suffered when their vehicle encountered an improvised explosive on March 23rd. They were assigned to the 4th Battalion, 64th Armor Regiment, 4th Brigade Combat Team, 3rd Infantry Division, Fort Stewart, Ga.
Pvt. George Delgado, 21, of Palmdale, Calif.
Staff Sgt. Christopher M. Hake, 26, of Enid, Okla.
Pfc. Andrew J. Habsieger, 22, of Festus, Mo. Spc. Jose A. Rubio Hernandez, 24, of Mission, Texas. With the success of the U.S. Surge... one can safely say al Qaeda in Iraq has been given a massive blow and is now on the run and almost out. With that said... one can also say that it is now Iran’s turn to be forced out of Iraq and out of its fragile government. So let it be said today... that this new major operation, by the Iraqi Army mind you, in the southern oil-export city of Basra... could very well be the defining battle against the Shi'ite militias in Iraq. Was McCain Right About Iran Training al-Qaeda? 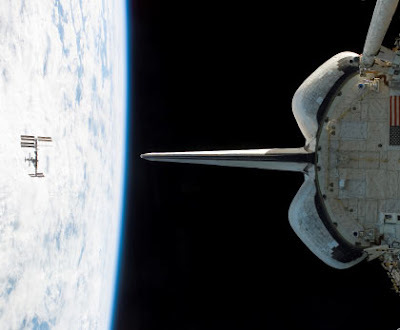 Image above: Space shuttle Endeavour's second landing opportunity at Kennedy Space Center, Fla., occurs on orbit 249. 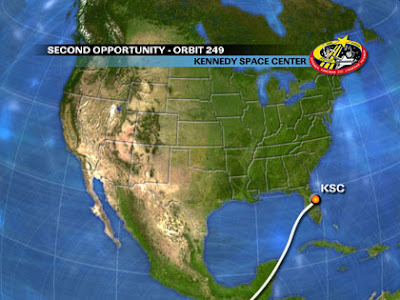 Unstable weather in the Kennedy Space Center area forced flight controllers to pass on STS-123’s first landing opportunity. The Spaceflight Meteorology Group continues to monitor weather conditions at and around the Shuttle Landing Facility at the Florida spaceport. If flight controllers give STS-123 the go-ahead to land on the second opportunity, Orbit 249, Commander Dominic Gorie and Pilot Gregory H. Johnson will fire Endeavour’s thrusters at 6:33pm CDT to begin the descent to Florida for a landing at 7:39pm CDT. Space Shuttle Endeavour Coming Home!!! U.S. Army Sgt. Harry J. Laurence of Cleveland, Ohio. He will be buried April 9 in Arlington National Cemetery near Washington, D.C.
Lance Cpl. Dustin L. Canham, 21, of Lake Stevens, Wash., died March 23rd from a non-hostile incident in Djibouti. He was assigned to Marine Forces Reserve's 6th Engineer Support Battalion, 4th Marine Logistics Group, Portland, Ore. The incident is under investigation. Media with questions about this Marine can contact the Marine Forces Reserve public affairs office at (504) 678-6539. 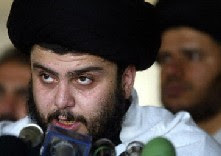 Iraqi Shi'ite cleric threatens widespread "civil revolt"
President Bush did NOT lie about the Iraq War like you Dems have preached, with passion I might add, over and over again. Now... if you want to KNOW what a flat-out lie is... well... this is a perfect example! Tuesday, March 25, 2008 About Photo: The International Space Station is pictured from space shuttle Endeavour as the two spacecraft separate after undocking. The crew of space shuttle Endeavour is spending today getting ready for its journey home and the end of the STS-123 mission. Among the preparations is a test of the thrusters that will be used to position the orbiter for re-entry and the control surfaces for its flight through the atmosphere. After this testing is complete, the crew members will speak to members of the media on Earth. The STS-123 astronauts also will set up the recumbent seat for Mission Specialist Léopold Eyharts, who joined the crew of Endeavour on the International Space Station. The recumbent seat is a special seat designed to reduce the stress of gravity on those who have spent long periods of time in the weightless environment of space. STS-123 arrived at the station March 12, delivering the Japanese Logistics Module - Pressurized Section, the first pressurized component of the Japan Aerospace Exploration Agency’s Kibo laboratory, to the station. The crew of Endeavour also delivered the final element of the station’s Mobile Servicing System, the Canadian-built Dextre, also known as the Special Purpose Dextrous Manipulator. In addition the STS-123 astronauts delivered Expedition 16 Flight Engineer Garrett Reisman, who replaced Eyharts, a European Space Agency astronaut, on the station. The orbiter is scheduled to land at Kennedy Space Center, Fla., tomorrow evening at 6:05pm CDT. A second landing opportunity comes at 7:39pm CDT. Forecasts from NASA are predicting favorable conditions at landing time. Note: I’ll Post on the Landing Wednesday so check back and watch it LIVE! Safe Landing goes out to the crew of Space Shuttle Endeavour.